Looking at recent content recommendation data presents a very positive picture for the advertising format. 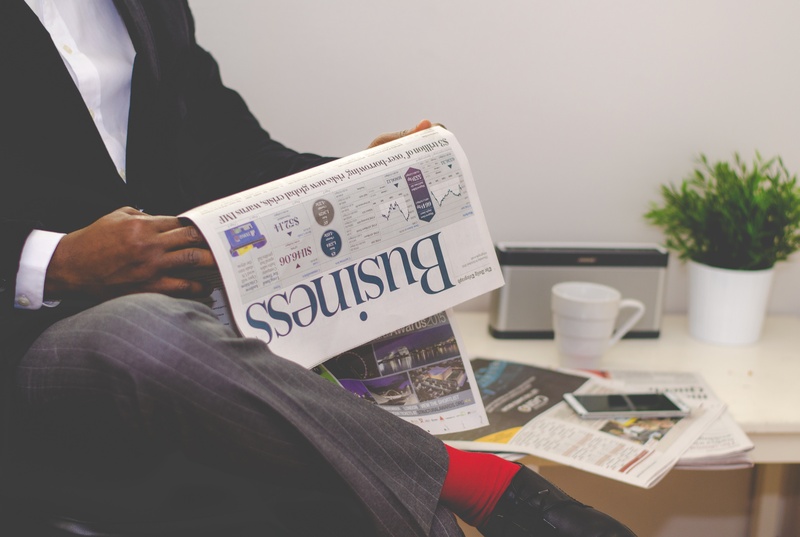 In this article, I will present some of the most intriguing and essential data publishers should know about content recommendation. But, beyond the data, it’s also important for publishers to understand why content recommendation is such a powerful tool. Answering this question provides valuable insights for publishers hoping to to maximize their benefits from this dynamic ad format. Content recommendation is much more than ads for “30 Gigantic Cats You Won’t Believe Are Real” or “10 Photos That Will Blow Your Mind.” It is a leading monetization strategy for many of the world’s premium publishers. Now, let’s take a look at some essential content recommendation data. Content recommendation is a growing market. In 2016, the global content delivery market is anticipated to grow at a rate of 20% globally and 21.3% in the United States. Taboola, a content recommendation company, reaches 88% of US Internet users and nearly 1 Billion unique users a month. Together, Outbrain (another big player in content recommendation) and Taboola, reach over 1.5 Billion unique users per-month, outperforming Facebook. Revcontent, a large content recommendation platform, serves 100 Billion content recommendations a month and saw a growth rate of 900% last year. Businesses are increasingly using content to get leads and exposure. Currently, 86% of businesses are using content and 70% are creating even more content than they did the year before. Brands see more exposure and better engagement with content recommendation. Brands that used professional content and product videos saw a nearly 30% increase in engagements. Content recommendation works best when content is personalized. In fact, 38% of individuals surveyed were willing to specify their individual interests in order to get more personalized content. The data shows a very clear picture: content recommendation works, it’s getting bigger, and it presents a huge opportunity for publishers. Why is content recommendation so powerful for publishers? The data pointing to the success of content recommendation is clear. However, the question I think publishers need to be asking is: Why? Decreased bounce rates. This is especially true for publishers that utilize content recommendation to drive traffic within their own sites. Content recommendation can function as a tool to keep readers on your site and interested in more content. Increased pages-per-session and time-on-site. If your site is struggling to keep users active on your site, content recommendation can be used to keep readers engaged within your site. Increased engagement. What’s essential to understand about content recommendation is that it works well because it’s specifically designed to engage readers. Unlike typical online advertisements, content recommendation is written specifically with readers’ interests in mind. 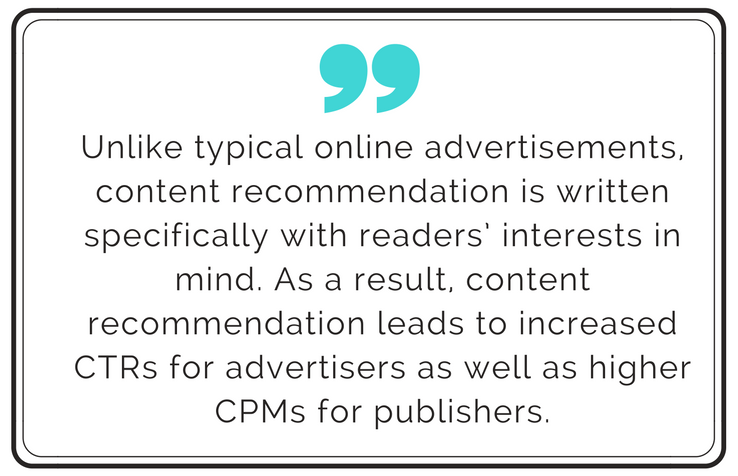 As a result, content recommendation leads to increased CTRs for advertisers as well as higher CPMs for publishers. Content recommendation is almost effortless. Publishers that use content recommendation primarily as a monetization tool, have little work to do in order to run the ad format on their sites. Publishers can easily implement the technology on their sites and it requires minimal monitoring. As a result of high engagement rates, content recommendation is one of the easiest, yet most lucrative ad formats available.